Keeping in touch with your customers is good business. This is especially true when they have requested it. This article will explain why building a customer contact list and keeping in touch is so important and so valuable to your business now, and in the future. Permission-based marketing is when people have given you permission to send them your offers. If people have had a good experience in your restaurant, they’ll often give you permission to keep in touch, especially if you have a special offer for them. Keeping in touch is easy and cheap with email marketing automation. It’s also really valuable. It’s not your customer’s job to remember you, it’s YOUR job to remind them you exist. When people give you their email contact information, they’re ASKING you to REMIND them. This is a gift. You want to be remembered when the question arises: “Where do you want to go out to eat (or order take-out)?” Among ALL the choices there are (and new ones popping up constantly), it’s a lot easier to be remembered when YOUR restaurant shows up in their email inbox once a week. Even when the customers on your list don’t open your email, they will usually SEE your name and subject line which reminds them of you. Why do customer stop coming to a place? It’s SO important to keep in touch! 68% leave because they felt the sales person and company were indifferent to their needs. They feel taken for granted. Of course, there’s nothing you can do about those who die or about those who move out of the area. But if you have permission to keep in touch with people, you can continue to keep in touch with a friendly message and an offer. Done with class, this will help you retain more customers, even win some back. When someone fills out a signup form like the one pictured above, the information will need to be manually entered into an email database. This is about the only part that’s not automatic, but it’s not difficult. A page on your website should be setup with a similar form or coupons. These can be setup to capture your customers’ contact information and automatically add them to your email database. Email marketing technology allows us to setup emails in advance. Your email messages can be planned ahead to be sent on a schedule of your choosing-once per week, every other week, or once each month. NONSENSE! Remember, this is a permission-based list. They have given you permission-they have asked you to send them your stuff. You’re practically under obligation! Besides, everyone on your list can opt-out which automatically removes them from the list. Think about the possible lifetime value of this customer. Do the math: if you can get just 50 customers (with a party of 4) to come back in just 3 more times per year by keeping in touch, how much more revenue will you generate? When you advertise with Groupon or in print (coupon mailers or local magazines), people will visit your website to take a closer look. 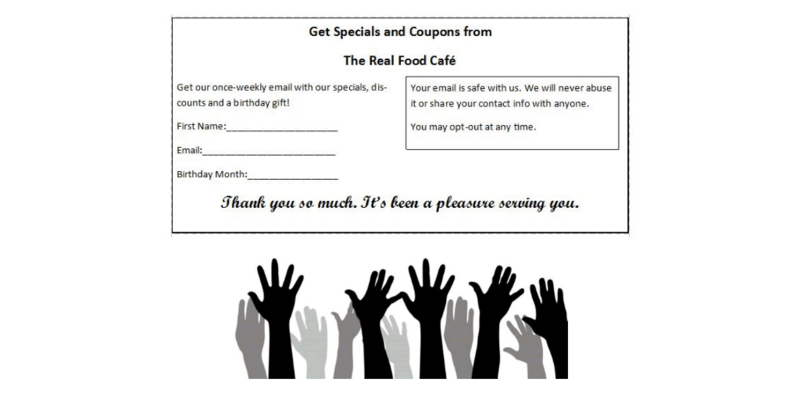 If you have a page on your website called Specials and Coupons, people will opt-in to your contact list. Now, every time you advertise, you’ll not only get a bump in sales, you’ll also be building your list. When you send out emails, you’ll see a bump in revenue. You’ll be on a mission to grow your list bigger and faster. 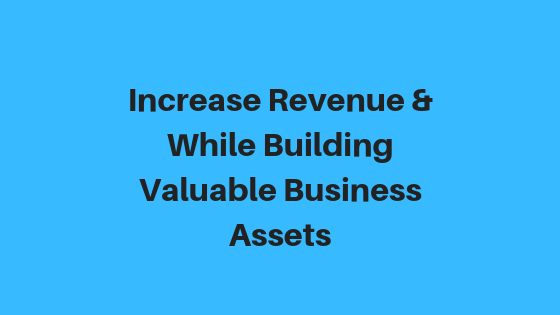 Not only will you generate more revenue, you’ll also be creating a new asset: YOUR LIST. Your huge list of customers (fans), is property-property which makes your business more valuable to you NOW and makes your business more valuable and attractive to a potential buyer. ADVERTISING GETS PEOPLE TO MY WEBSITE > PEOPLE ON MY WEBSITE GETS PEOPLE TO SIGN UP FOR MY EMAIL > PEOPLE IN MY RESTAURANT GETS PEOPLE TO SIGN UP FOR MY EMAIL > SENDING EMAIL KEEPS PEOPLE COMING BACK MORE OFTEN > PEOPLE COMING BACK MORE OFTEN GENERATES MORE REVENUE AND HIGHER LIFETIME CUSTOMER VALUE > A BIG CUSTOMER CONTACT LIST INCREASES THE VALUE OF MY BUSINESS NOW AND IN THE FUTURE.